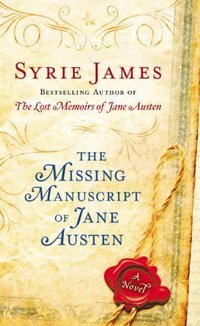 Well that’s a headline to entice many readers and collectors -- it’s also the title of a new novel by Syrie James, author of The Lost Memoirs of Jane Austen. In The Missing Manuscript, James uses a twenty-first-century story to frame the nineteenth-century narrative, i.e. Austen’s missing first novel. While on vacation in England, Samantha McDonough, an American special collections librarian who failed to finish her dissertation on Austen at Oxford, pops into an antiquarian book shop and picks up an old poetry book. Much to her surprise, a letter is found tucked into the uncut pages, and that letter turns out to be an unknown and unsigned letter from Jane Austen to her sister. Better still, the letter mentions a missing manuscript. While that frame proved hackneyed at best, Samantha does uncover a manuscript, stowed away in a secret cupboard in an English country manor house. (She also finds its handsome, young, divorced owner, Anthony Whitaker.) They begin to read the manuscript, written in 1802. It involves a clerical country family named the Stanhopes, who endure financial and social ruin and an embarrassing trip to Bath. The characters of Rebecca Stanhope and the friends and suitors she encounters have more life to them than their modern counterparts in this novel. Thankfully, their well-plotted story constitutes the bulk of the book, which will delight Austen fans. It may even gain a few new ones. Meanwhile, back in the present, Anthony Whitaker is counting his chickens, ticking off prices of book and manuscript sales at auction found via his cell phone browser. He feels that his manuscript will break the current record--that of $30.8 million paid by Bill Gates for Leonardo Da Vinci’s Codex Leicester. With the proceeds, he can restore his family’s ancestral home. But will he sell? After several hours amiably passed, you, dear Reader, will know the answer to that. Well that's a headline to entice many readers and collectors -- it's also the title of a new novel by Syrie James, author of The Lost Memoirs of Jane Austen. In The Missing Manuscript, James uses a twenty-first-century story to frame the nineteenth-century narrative, i.e. Austen's missing first novel. While on vacation in England, Samantha McDonough, an American special collections librarian who failed to finish her dissertation on Austen at Oxford, pops into an antiquarian book shop and picks up an old poetry book. Much to her surprise, a letter is found tucked into the uncut pages, and that letter turns out to be an unknown and unsigned letter from Jane Austen to her sister. Better still, the letter mentions a missing manuscript. Meanwhile, back in the present, Anthony Whitaker is counting his chickens, ticking off prices of book and manuscript sales at auction found via his cell phone browser. He feels that his manuscript will break the current record--that of $30.8 million paid by Bill Gates for Leonardo Da Vinci's Codex Leicester. With the proceeds, he can restore his family's ancestral home. But will he sell?